Meet Erika Mulvenna, AKA Miss Sews-It-All. You already know her from her many WeAllSew posts, including her Sunrise Baby Quilt Sew-Along and all of our Sew to Serve and Linky Friday posts. Did you know she also runs our Facebook and Twitter pages? She’s an amazing woman… and just wait till you see her sewing studio! When did you start sewing and who taught you to sew? I learned to sew from my mother, who also learned from her mother! My mother is very creative, and was always sewing playthings for me, from little beanbag animals to a big stuffed horse recycled from an old coat. My first sewing projects were clothes for my dolls, but one of my favorite sewing memories as a kid was making a stuffed TV set for my bedroom, complete with silver fabric screen and rope electrical cord. 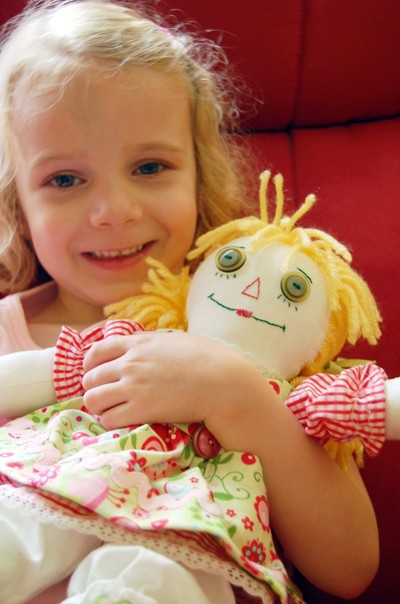 It’s no surprise that I also love sewing toys for my little girl as well! Fidget’s dollie made from a vintage Raggedy Ann pattern. We want to know, how did you end up working with BERNINA USA? I have a background in Fine Arts including a Bachelor’s Degree majoring in Fiber Arts, so I have a broad base of sewing skills including garments and creative sewing techniques. My BFA Fiber Arts work included garments made of fabrics that I hand-dyed and silkscreened with my own designs, and some made with alternative materials. 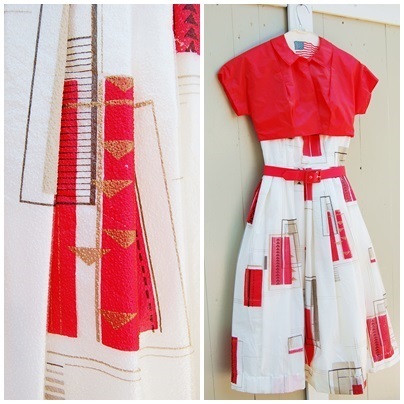 Coffee Cup Dress, 1995; hand dyed and silkscreened fabric, vintage dress pattern. I studied Fiber Arts at Southern Illinois University at Carbondale with Professor M. Joan Lintault, who sewed with BERNINA sewing machines. She always told me that BERNINA headquarters was near my home in Chicagoland. So, when I returned to the Chicago area to look for a job in 2005, one of the places I looked for work was BERNINA. I was hired in 2005 to work for BERNINA of America, Inc. and the rest is history! 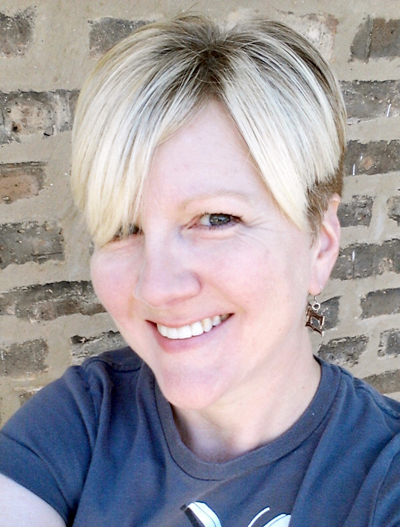 I’ve worked full-time administratively for the company and as a National Educator in the past, and currently I work part-time helping the BERNINA team manage its online social media community. Tell us about your most recent sewing project. My most recent finished project is a quilt, one that was an experiment in a technique called improvisational piecing. The basics of improvisational piecing are not knowing what the next course (or row) of piecing will be until you are ready to stitch it up. 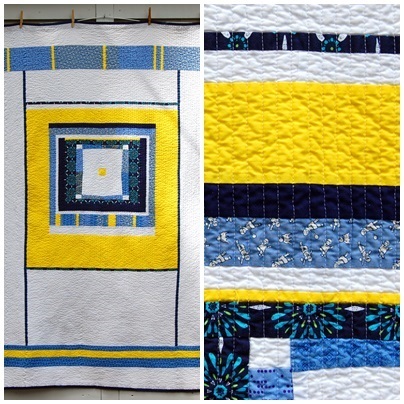 I used what little yellow and blue pieces I had in my scrap bin along with white, and just pulled out pieces as I was sewing, making decisions on the fly about the design. I really like the results. Although I have been sewing 30+ years, I only recently started quilting, and have really fallen in love with the process. One of my very first quilts was recently featured in an online QUILTY episode of “This is My Quilt”, you can see it right here! We want to know what sewing machine you use and if you have any favorite sewing machine feet or accessories? I do have a love for vintage sewing machines as well as modern machines, and have quite a few in my collection. So, I do sew on many different machines from time to time, including my very first BERNINA ever, a model 1080, a BERNINA 440 QE, and a new BERNINA 580. Lately I have been sewing the most on the BERNINA 580, and absolutely love it for quilting. The touch screen is an awesome tool for controlling my sewing, and displays all the current settings of my stitch. As far as feet go, I couldn’t live without the Patchwork Foot #37 for helping me sew a uniform seam while piecing, and the Walking Foot #50 has been wonderful for straight line quilting. 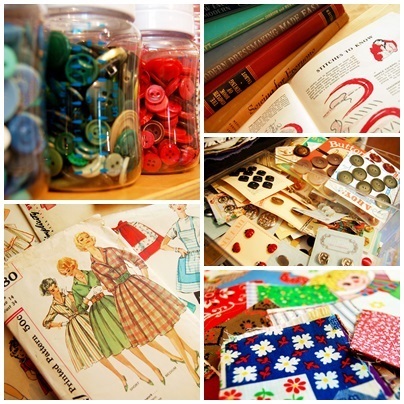 What inspires you to sew? 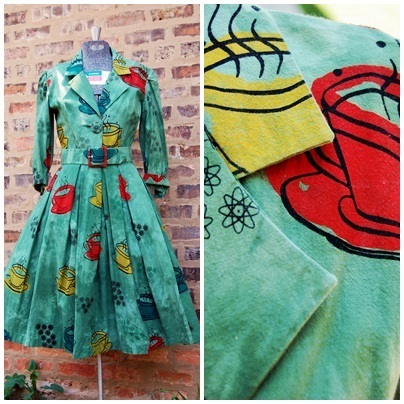 I find lots of inspiration from my collection of “old stuff” hanging around my sewing space. I collect old sewing books, patterns, sewing machines, sewing notions, irons, and even fabrics. I have a lot of respect for the women who sewed before me, and find lots of correlations between home sewers 100 years ago and today. After all, everything old is new again! Is that a sewing tattoo on your arm? Yes! I got it as a tribute to how much I love sewing, and how long I’ve been at it. 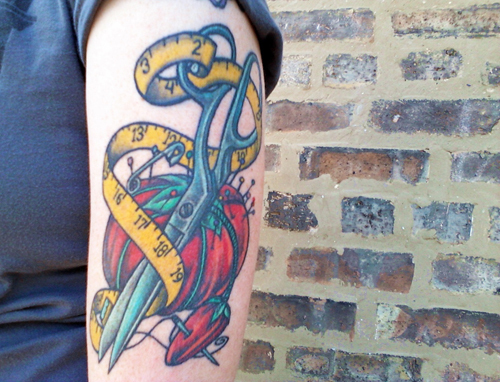 I had the idea for the tattoo and took a bunch of photos of scissors and sewing notions to my tattoo artist. He sketched out the design and it was exactly what I pictured – I love it! 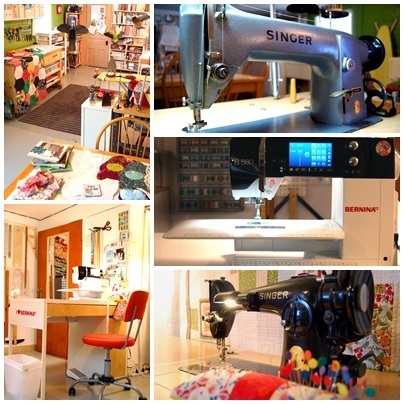 Where do you sew? Can you give us a tour of your sewing space? My current space is a bit of a “make-do” situation, since this isn’t a permanent home for us. I’m sewing in the basement of the house, and had to set up my space around several odd doors, columns, and open spaces. 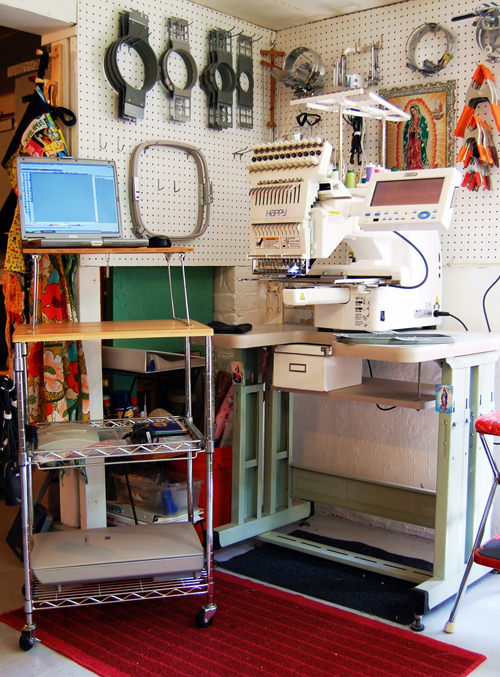 I use a desk for my main sewing area, and also have a vintage industrial machine set up, for sewing, too. My cutting table is a repurposed kitchen island, and I set up my ironing station wherever I need it in the room. One corner of the room is a dedicated space for machine embroidery. (It’s not pretty, but it is functional!) I turned a microwave cart on wheels into a rolling, stand up desk for using my BERNINA embroidery software, and can roll the desk wherever I need to work in the room. Notions, tools, and threads are stored wherever I’ve been able to find a place to stick them. Fabrics are in a few places, in bins under the cutting table and in boxes shoved away in another room. My dream sewing room would have enough space to store fabrics, notions, and tools all where I can easily access them. 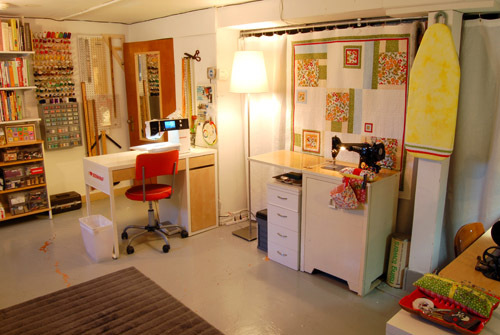 I’d also have enough space in my dream room to have two or three dedicated sewing areas, and one area just for machine embroidery. What’s next in your sewing future?